Google Chrome has a cool plugin that allows you to create 2 side by side “panels”. Sometimes when browsing for something (such as textbooks), it would be easier to have a second screen without having to have pop over to another tab or another browser screen. Or if you are using one screen for research and the second screen with Google Docs so you can write your report or document. You can use your windows system to keep two applications side by side or stacked. 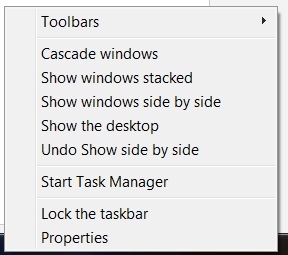 This option can be used by right clicking on task bar and selecting your choice. Want to arrange two (or more) windows side by side in Windows XP or Vista? Hold down Ctrl and click on the desired windows in the taskbar; then right-click the taskbar and select Tile Vertically. In Windows 7, you can simply drag any open window to the right or left edge of your screen and then let go.